Look at my new bag! Isn't it perfect for fall? A few weeks ago, I was offered a chance to test a new bag pattern for Jennifer at Ellison Lane Quilts. Of course I said yes! Even though I haven't ever made a structured bag before. Only totes and easy little pouches. The Southpark Bag was actually pretty easy to put together. You can buy the pattern for only $10, and it's very clear and easy to follow. Be sure to head over to her new site and see the other versions of the bag. It's a great project to highlight a favorite fabric, or one with a large motif or border print. I used some of my stash of Flea Market Fancy and one of the new prints from Croquet. They look good together, don't they? The hardest part for me was finding rings for the straps! I ended up taking a large set of silver D Rings off a belt. I did find some curtain grommets at my LQS, but they only had black or gold. Remember though, I live in the boonies and I didn't check Michael's or Hobby Lobby. I'm sure you could find some there. It has a divided pocket inside for your phone, and a magnetic snap closure. It's a great size for me - plenty of room for my wallet, kindle, makeup bag, and snacks. I am really proud of my first quilted bag. I'm not quite ready to tackle a weekender, but I may attempt a duffle bag for my trip to Houston next month! Thanks to Jennifer for letting me try this out. And be sure to stop by her new site Ellison Lane and enter to win her big giveaway! There's also a Back To School blog hop starting 9/21, you'll want to check that out too. Oh! If you're planning to be at quilt market next month, drop me an email at craftytammieATyahoo.com I'd love to meet some of my readers and put faces with the names! 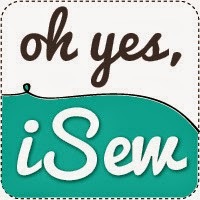 linking up with a new sewing link party iSew! Your bag turned out darling!